Create self-made DVD is actually a piece of cake. With this DVD authoring software, you can painlessly convert and burn a wide range of videos to DVD, such as MKV, M2TS, M4V, MP4, AVI, WMV, H264, MPEG, RMVB, RM, MOV, ASF, etc. The internal versatile video editing tools let you make personalized . It help to create home video DVD from video files, camcorder, webcam, Youtube. It is cool because you can convert and burn various videos to DVD. Then, you can share the DVD with your friends or family. You can watch the DVD with your DVD player too. It can burn MKV, M2TS, M4V, MP4, FLV, MPEG, MOV, RM, RMVB, H.264, AVI to DVD, etc. Equipped with fast and powerful decode encoder engine, this free DVD burner software takes less than one hour to create a full 4.3 G high quality DVD, while delivering 100% excellent audio and video effects. Furthermore, it is fully compatible with DVD+/-R, DVD+/-RW, DVD DL+R, DVD DL+/-RW that perfectly help you backup your precious files. 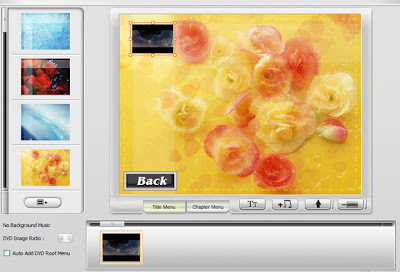 At the DVD Author page, you can see a variety of options to edit your video files. It also has the abilities to create DVD menu & chapter menu as you need. Built in high quality decode & encoder engine that offer an excellent audio and video effects. You can create DVD-5 or DVD-9. You can create NTSC or PAL DVDs. You can use a 4:3 or 16:9 aspect ratio. And other features, you can convert videos to .VOB format. You can also add DVD menus to currently existing .VOB videos and burn them onto a DVD. If you not sure about what you do with this, please check the Tutorial on WinX DVD Author. 1. Subscribe RSS feed and submit your email, then verify your subscription if you want to know some FREE softwares.